Target audience: Nonprofits, foundations, NGOs, social enterprises, cause organizations, brands, businesses, Web publishers, educators, journalists, general public. At last week’s Nonprofit Technology Conference in San Francisco, the Socialbrite team debated which app would be most useful for us to locate each other and easily share our plans on which sessions or which parties to attend. The first decision came with our agreement that a mobile app was the way to go. While we have a secret Facebook group (well, secret until now! ), it’s just easier to check a single app on our mobile devices rather than check our crowded Facebook notifications. If you have three or more team members who are attending an event or who need to stay in touch while on the road, you have a few options. Without much debate, we settled on GroupMe, a free group messaging app. I like it because it’s both instant and asyncronous — that is, your teammates will see your updates instantly or when they next check their mobile devices. Here’s how it works: Call up GroupMe and invite others in your posse to join your private group. Type your update and send it to the group, as you would an SMS message, and they’ll see it in a chat thread. (You also have the option of including a wider circle of colleagues who use GroupMe, but we stuck with the private route.) We used GroupMe as a way to settle on a time and place to meet in person as well as a means of keeping on top of the best sessions activities to attend. One of GroupMe’s key features is that it’s cross-platform: You don’t miss a beat whether you have an iPhone, Android, Blackberry or another kind of smartphone. In addition to the ability to share messages, photos and locations like the other apps, GroupMe also allows old-fashioned conference calls to your group for occasions when voice is easier than tapping out a message. Among its advanced features, GroupMe figures out if you have a good or bad wifi or data connection and will switch to SMS for messaging if it things get bad – a common occurrence at conferences. We also like GroupMe because of its humble origins: It was created at a hackathon in 2010, though it was sold to Skype last summer in this fast-moving space. At last summer’s National Conference on Volunteering and Service in New Orleans, Chris Noble of Cause Media Group introduced me to Beluga, one of the early players in this space. But Facebook bought the service last year and — what a shock! — shut it down to make way for Facebook Messenger. While we haven’t heard anything bad about Facebook Messenger — go ahead, try it out and tell us what you think — as a general rule we’re not inclined to support apps that will essentially reduce choice in the marketplace, as Facebook (and Google) are increasingly doing. The other mobile messaging app that captured a lot of buzz last year, Fast Society, is no more, but its website promises to soon unveil a new player: Cameo. And, if all your team members are on a common platform, like Android, you may want to check out EchoUp Messenger or some similar apps. 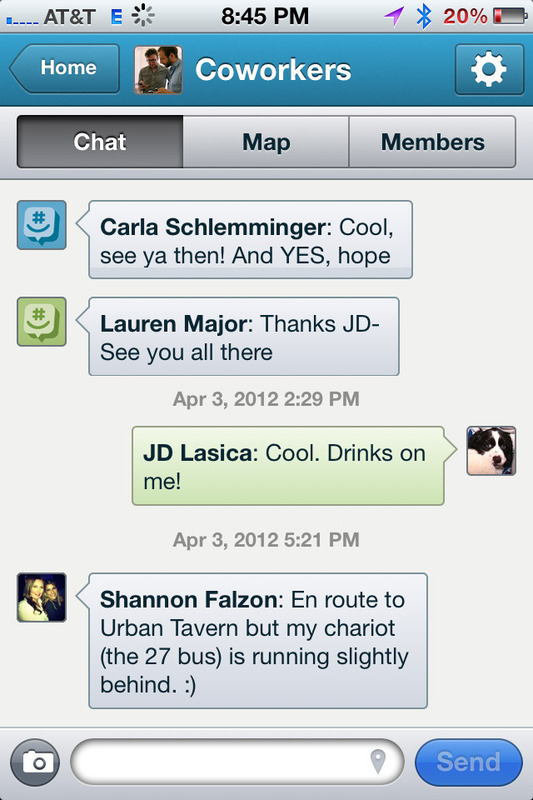 But for a free, all-in-one solution, we found GroupMe to be the easiest way to keep in touch with fellow team members. Agree? Disagree? Please share your own experience with mobile messaging apps. JD Lasica, founder and former editor of Socialbrite, is co-founder of Cruiseable. Contact JD or follow him on Twitter or Google Plus. Hope you’ll be at the #13NTC, too! I prefer the GroupMe app than the Facebook Messenger because like what you said it is cross-platform so I can connect whether I use my iPhone or my Blackberry. Thanks for sharing this!